Thank you Explore Cuisine for sponsoring this post! 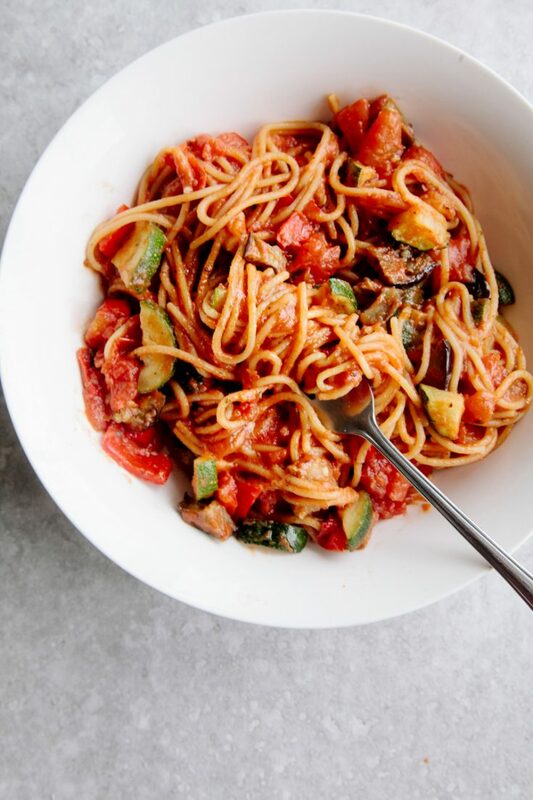 When Explore Cuisine sent me some of their new Chickpea Pasta to make a recipe with, I wanted to create something that was both healthy, to make the most of it’s high protein & fibre plus something that’s quick and easy to cook. Gluten-free pastas can be hit or miss. Generally, there are some really great ones out there but I’ve definitely tried a few that I wouldn’t taste again, even if you paid me too. Thankfully, this Chickpea Spaghetti was on of the best. 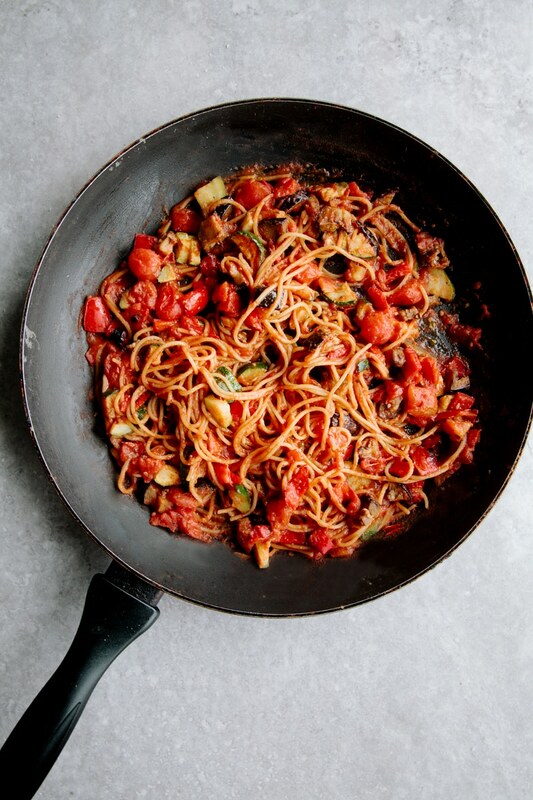 Especially texture-wise, I feel this spaghetti held together much better than other gluten-free pastas. No sogginess, just that perfect bite and texture. And the fact it’s so healthy is definitely a bonus! 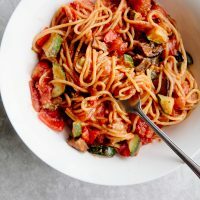 The great thing about using gluten-free spaghetti in one-pot dishes is that the starch, from the spaghetti, mixes with the water to create a sauce. A lovely, thick sauce. The other great thing about these one-pot pasta dishes (particularly when using a pasta with a great nutritional profile, such as this chickpea pasta) is you don’t lose out on any of the nutrients. Usually we throw the cooking water away but here, the cooking water becomes part of the sauce and therefore still contains all of the nutritional goodness. 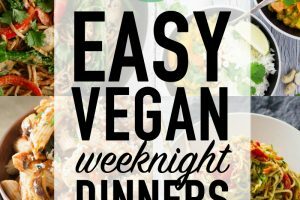 This dinner takes under 30 minutes to make and tastes wonderful! Plus it's healthy, vegan and gluten-free. 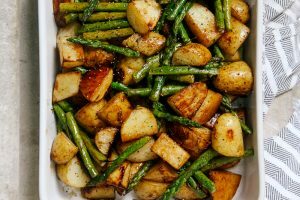 Heat the olive oil in a frying pan. Add the onions, garlic, courgette, aubergine and peppers. Cook for a few minutes on a high heat until lightly browned. Add the chopped tomatoes, water, vinegar and spaghetti. Bring to a boil then simmer for 10 minutes until the pasta is cooked and the sauce has thickened. Stir in the chopped basil and add salt and pepper, to taste. Add the nutritional yeast, if using. 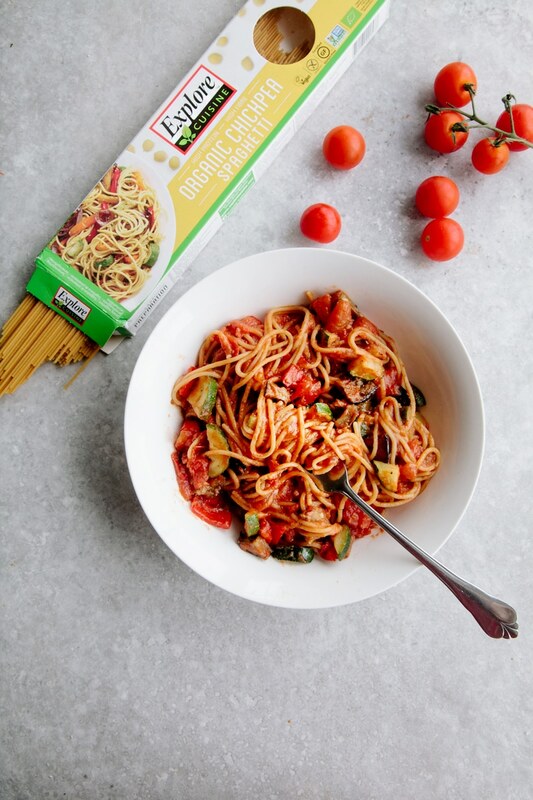 Explore Cuisine’s Chickpea Spaghetti is available in ASDA, Holland & Barrett and Planet Organic. Retail price is £3.29. The pasta dish was awesome! I also cooked the spaghetti separate and added it to the sauce and vegetables! Yummy! I doubled the recipe with no problems! I will definately make it again! I drained one of the cans of tomatoes and used the juice of the other one....I will probably add more garlic next time! id like to try to double this recipe for my family this evening. 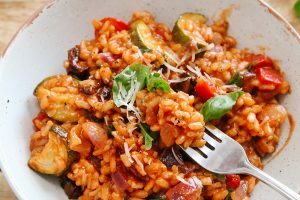 after reading what others have said, I'm curious if it would be better if i made the pasta separately and then added it, already cooked, to the veggies? should i add water with it? or should i just double everything and follow the directions? i have heard bad things about too much liquid... any suggestions or recommends i would greatly appreciate! thank you! 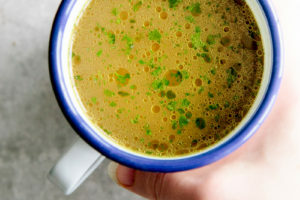 make this last night and it turned out really well. Thanks for the recipe! Mine came out a tiny bit watery, and lost some flavor but we readjusted, added some spices, and thankfully our guests we're late so the water ended up evaporating by then anyways. I made this today and used black bean spaghetti. It was delicious, but I will be using less water and more seasonings next time. I tried this recipe with whole wheat pasta and I made it for 7 people. The whole thing came out tasting like bland watery tomatoes and the sauce never thickened well... How did you season this to taste good? Hey..the recipe turns out super delicious..there are videos on YouTube that show this recipe. Since my staple diet doesn't include pasta, I checked the videos for instructions. Same recipe tried by someone put up in video format. Happy eating! I have made this recipe twice. The second time I cooked the spagetti separatly and ommited the water from the sauce. I prefer it this way. Thanks for your feedback Nancy, glad you enjoyed it. OMG!!! 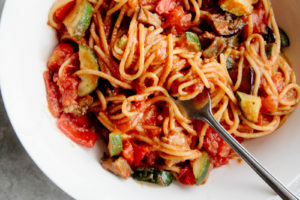 This recipe is amazing, I love spaghetti and this will be perfect for me and my girl because we are vegetarians. Thank you for sharing this delight with us. I am over here drooling over this dish right now. I am all over this. I can’t even stop starring. Looks really good. Defo going to try it. But what if i can't get hold of chickpea spaghetti which other one could i use? Oh my gosh this looks so good! I am over here drooling over this dish right now. I am all over this. I can’t even stop starring. Insanely adorable and delicious! We used to eat ratatouille once a week when I was a kid. This looks like a big bowl of nostalgia! Aw, I'm pleased to hear that, Becky! Chickpea pasta sounds interesting. I love one pot recipes. This one looks fabulous! Thank you, Rahul! I love one-pot recipes too. Anything that saves on washing up is a good thing. I love the sound of this pasta Aimee, I must look out for it. I've tried bean pasta but it's usually gone mushy. I love the recips, so Summery and delicious. This one is mixed with a bit of brown rice which I think helps it keep it's structure. Tastes really good though! I also have some chickpea fusilli which I need to try. I haven't heard of chickpea pasta before, but am not surprised it exists. Must try! This looks incredible! O love this!! 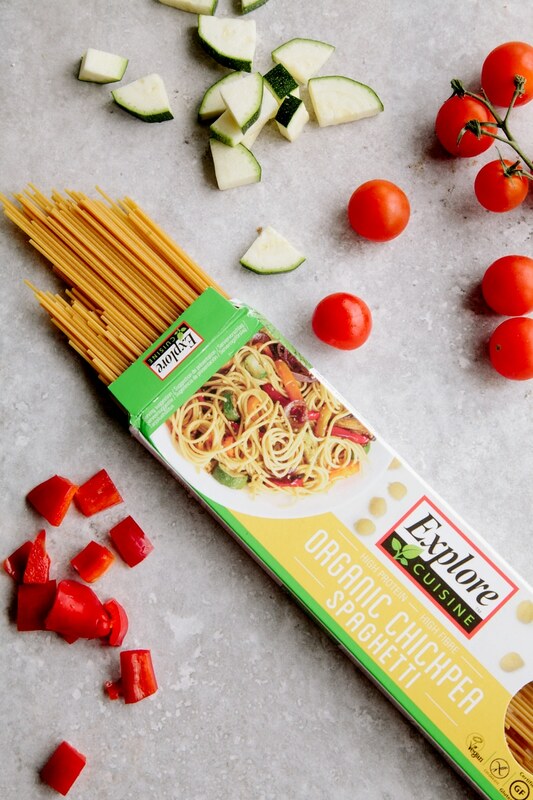 Explore Asia has some amazing pastas! 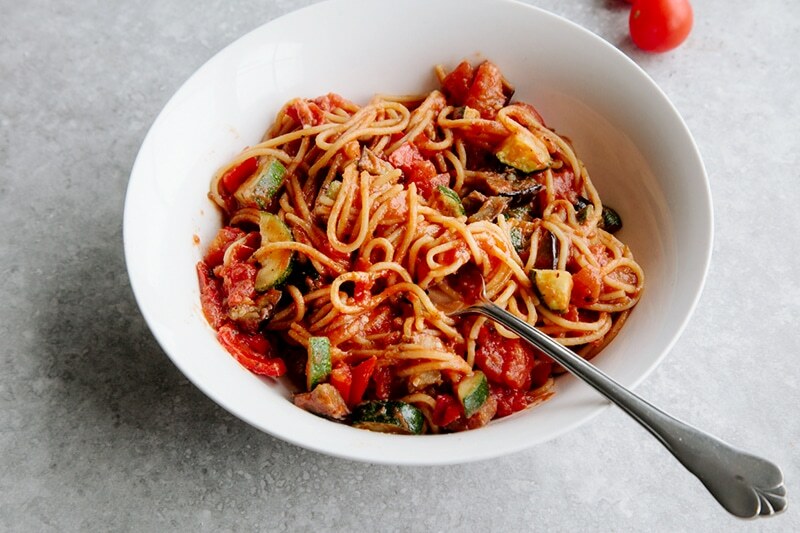 Have you tried the red lentil spaghetti?? That one tastes exact!! Ohhh I will definitely try that one next! I haven't seen that in the shops but I might have missed it.